With Ford's new Mustang having won all six of the races so far this year, new ballast regulations were enforced off the back of centre of gravity testing after the Australian Grand Prix. As a result the six Mustangs in the field have been forced to reposition 28 kilograms of ballast to the roll hoop, while the 14 Commodores in the field have shifted 6.7 kilograms of weight to the roof line, right behind the top of the windscreen. While the unique Symmons Plains circuit did throw up a change in form, Holdens locking out the top five in today's crucial second practice, top drivers from both sides were reluctant to attribute any gains or dips in performance to the weight distribution. 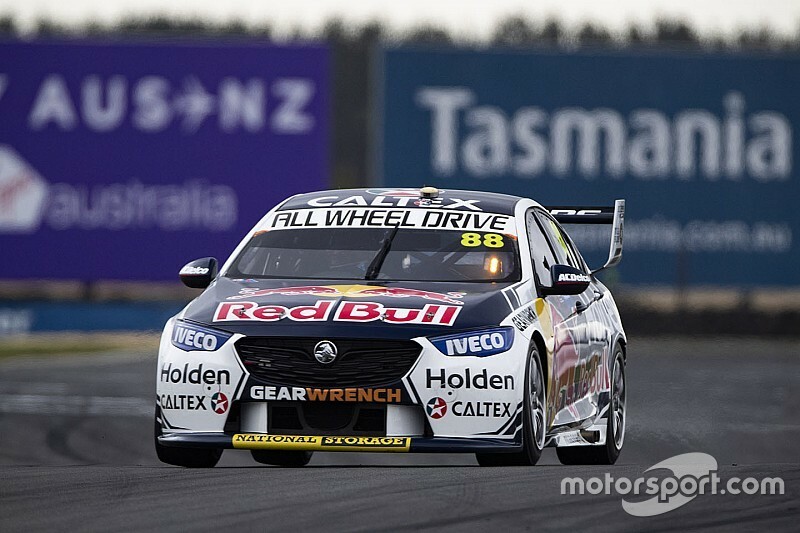 "I don't think you'll notice six kilos around here," said van Gisbergen, who was second fastest in Practice 2. "I don't think centre of gravity is a big thing; I'm 15 kilos heavier than Jamie [Whincup] and we're pretty evenly matched every week. Scott McLaughlin, who was seventh fastest this afternoon, said that he was unimpressed with the aesthetics of having nearly 30 kilograms clamped to his chassis, but that he didn't feel a major difference in the handling. "I think on a test day, if we had put it in and back-to-backed it, I would have been able to say 'yeah, it was the difference'," he said. While the Red Bull Holdens were on top today, pacesetter Whincup reckons the Mustangs could still hit back tomorrow. Speaking post-practice he said he thought he'd run better tyre condition than the Mustang-shod drivers, and that he'd need more pace tomorrow to grab pole for the first race. "There's a big tyre difference going on," he said. "I ran four green tyres, but most of our main opposition only ran two. There's a little bit of time in that. "All things considered I think it's pretty close. If we don't make a gain tomorrow, we'll get done." However McLaughlin disagreed with the tyre conditions situation, attributing any lost time to a mistake at Turn 1 on his best lap. "They're talking s**t," he said. "I ran four tyres. We just had a different warm-up phase. "What we did, we heated the lefts up, and then put the right sides on. Over the years I've tried a bit of both and my preference is probably four tyres. So might find a little bit of time in that too maybe, I don't know. "There's a lot of time, probably, in me. I made a big stuff up at Turn 1. "But it's going to be close. It always is here. It's what we expected. [The Red Bull Holdens are] fast, for sure, and have been all day, so we'll have to see how we go. "We made the 10, so that's the main thing."